Bernie Madoff’s Watches to be Auctioned This Saturday – I Already Have a Watch. Bernie Madoff’s collection of rare and vintage watches will be auctioned Saturday, Nov. 14, 2009 by Gaston & Sheehan Auctioneers on behalf of the US Marshals Service to raise money to help compensate victims of his massive Ponzi scheme. As I commented earlier this year Bernie Madoff was known to be a collector of vintage watches, many of which were seized by federal authorities. Additionally, Madoff had attempted to mail several them to friends and relatives following his arrest in violation of a court order. I confess I really hadn’t been following the story much in recent months and had all but forgotten about it, but I’d always been wondering more about the details of the watches as details have been scarce. A perusal of the catalog reveals a few semi-interesting watches, and Kyle at Perpetuelle.com has done a pretty decent job of summarizing and hitting the high notes on some of the ones that seem more interesting. Rolex Oyster Chronograph referred to as "Monoblocco" of the same type as some sent by Rolex to British prisoners of way in Germany during WWII. Photo: US Marshal's Service. One of the listings that would potentially be very interesting is lot #237, the Rolex Oyster “Monoblocco” chronograph. 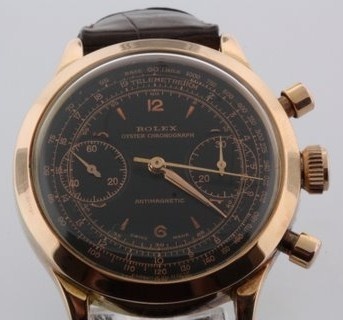 This type of chronograph is among the models known to have been sold by Rolex to British prisoners of war held by Germany during World War II, as described in this Timezone article and this one by James Dowling. Although it has become common in the trade to do so, the moniker is applied somehwat loosely if not aberrantly here as aside from sharing a model number (and a reasonably close serial number) to one of the documented examples, there is little to no association with the actual watches actually sent to POWs. Many of the listings are described as “professionally restored,” which of course devalues them considerably as knowledgeable collectors prefer watches in their original, unaltered state. Refinished dials and cases can dramatically reduce collector interest and auction prices. It should also be noted that this US Marshals auction covers the property of a number of offenders who have forefeited properties for various reasons, so it can’t be said with absolute certainty whether any item or watch not specifically described as such formerly belonged to Madoff from the catalog alone. According to this Bloomberg article 17 of the Rolexes belonged to Madoff, but it’s still not exactly clear which. Notably, the US Marshal’s website does indicate that the “Monoblocco” Rolex Oyster Chronograph did in fact belong to Madoff. It will be interesting to see how these ones fare on the auction block. Although the notorious Madoff name could itself potentially attract interest and elevated bids, the watches themselves are otherwise not likely to command premium bids from discerning collectors as the bulk of them have been restored. I have to say that overall I’m a little disappointed in what we see here. It was fun to imagine what sorts of stunningly rare and remarkable watches a paper billionaire with a penchant for vintage Rolexes might own, one who was able to pay the best experts to assist in his buying and could likely outbid almost anyone if he chose. Instead, it seems that most of what he wound up with was re-dialed and re-finished crap, much of it the sort of thing collectors would tend to avoid on eBay and such. Anticlimactic in a way perhaps, but somehow very fitting. It seems money can’t buy taste. 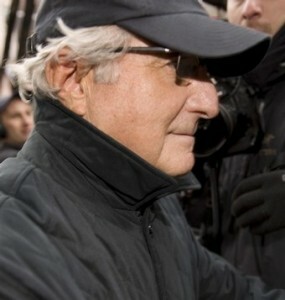 A Few of Bernie Madoff’s Favorite Things: Watches? Tagged with auction, madoff, Military Watches, Vintage Watches.